Employee retention is often cited as one of the top value-on-investment (VOI) metrics that companies use to measure the contributions of their employee wellness program. The best way for employers to measure their success with employee retention is to look at internal retention metrics and benchmark them against their peers. Companies can also leverage data from a large sample of employees, and that is just what a report from Optum did. Based on a survey of more than 1,200 full-time employees at companies with at least 3,000 employees, Optum found that engagement in employee wellness programs was linked to greater employee retention. It also found that greater employee loyalty was also found in employees that were offered but did not participate in an employee wellness program. Before diving into the link between employee wellness programs and retention, it is important to understand the state of employee loyalty and retention in general. Another Optum study found that only 19% of employees are enthusiastic about their future with their employer, 35% of employees would recommend their employer, and 28% of employees would re-apply for their job. There are many factors that impact employee retention, and wellness benefits are certainly one of them. The survey found that 48% of employees that always or frequently participate in their employee wellness program are likely to recommend their employer compared to 30% and 29% for employees that occasionally and never participate, respectively. Only 18% of employees without an employee wellness program were likely to recommend their employer. With a Center For American Progress study suggesting the cost to replace low-wage (<$30,000 per year) and medium-wage ($30,000-$50,000 per year) employees is 16% and 20% of annual salary, respectively, and higher wage employees being even more costly to replace, the financial impact to employers is large. The study also found that irrespective of participation, employees are more likely to recommend their employer if they had more wellness offerings. Fifty-three percent of employees with seven to eight wellness offerings would likely recommend their employer while only 24% of employees with one to three offerings would do the same. Compared to employees with no access to wellness programs, employees with seven to eight offerings were 2.9 times more likely to recommend their employer, 1.5 times more likely to continue working for their employer, and 3.3 times more likely to be proud to work for their employer. Even if they don’t take advantage, offering [wellness] programs sends the message to employees that their employer cares about them. They like knowing the option is there if they ever need it. The report did go on to say that simply offering wellness programs is not enough. It is incumbent for employers to have the right mix of programs to drive optimal engagement. Since employee populations are becoming more diverse, it is important to have a wide array of options to meet the various needs an employee may have. 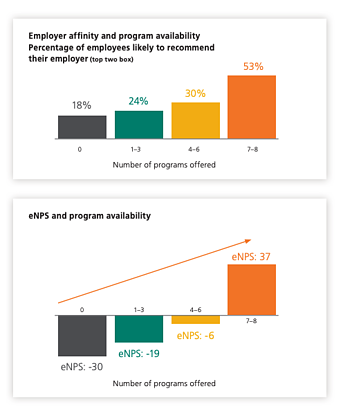 Employers providing seven to eight offerings were most successful when delivering a diverse set of options and were even more successful when those options were tailored to meet the needs of their organization.